There are many reasons why the idea you have in your head cannot actually be realized. Budget, geography, timing, and safety issues are just a few of the obstacles which could stand in your way. If there is no possibility for you to fly to Paris just to get the Eiffel Tower in the background or maybe employ a heard of wild animals to feature in your next masterpiece, then why not consider using a stock image to help make your ambitious dreams a reality? Once you have decided to take advantage of a stock image, it is best to see what kind of photographs are available before you actually shoot. Not only will this help to give you a good idea of what kind of images you might be able to use but looking at photos around the same theme can be a great source of inspiration. 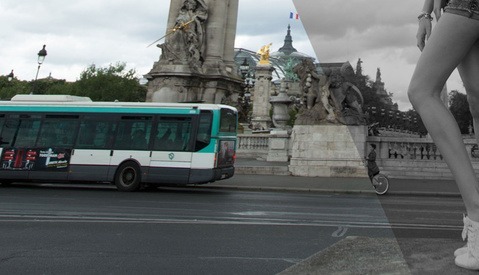 Compositing pictures together is a fairly easy task if both images in question are shot in a similar way. If you decide on a stock image first, when it comes time to shoot the rest of your project, you can make sure things like lighting, camera angle, and depth of field all match up. This could save hours of retouching and it will always make for a more convincing final image. There are many places on the Internet to source stock images, but I find Adobe Stock to be a great resource for high-quality pictures, and its extensive catalog means I never struggle to find what I need. I also really like how Adobe Stock is integrated into Photoshop making it easily accessible and how I don't have to commit to licensing an image until I'm completely sure it will work with my final composition. Being able to download a free watermarked version of an image really does help to visualize ideas compared to just staring at a web browser and taking a chance. Another cool thing about using Adobe Stock is that once I'm ready to commit to an image, I can convert to the high-res version without the watermark right within Photoshop itself. This is super handy if I've already started to play around with the image with adjustment layers or image masks. 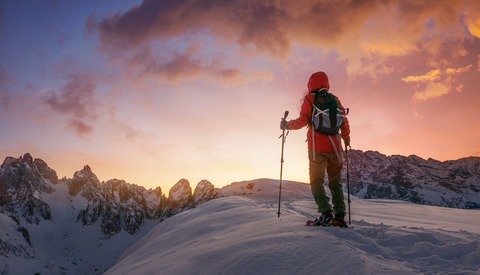 While browsing Adobe Stock, I saw this awesome picture by Mila Zvereva and while it is already a great photograph, I thought the addition of a stock image could help enhance things even more. I had in mind to add a wild animal to the desert scene in Zvereva's image. 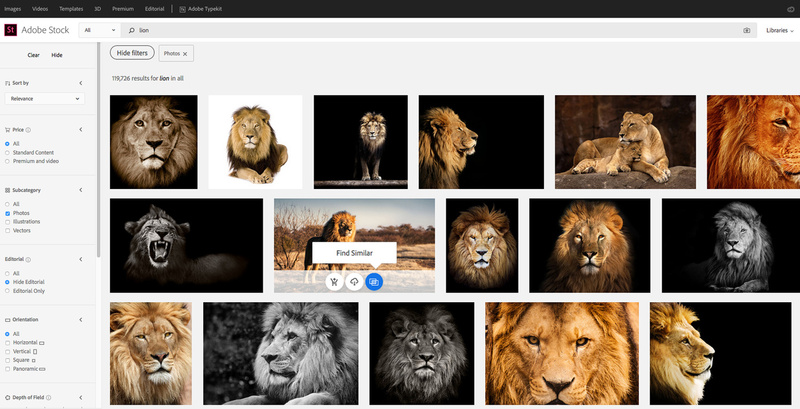 After deciding that a lion would be a good idea, I searched "lion" in Adobe's search bar to be greeted with a whopping 119,726 high-quality examples of a lion to choose from. 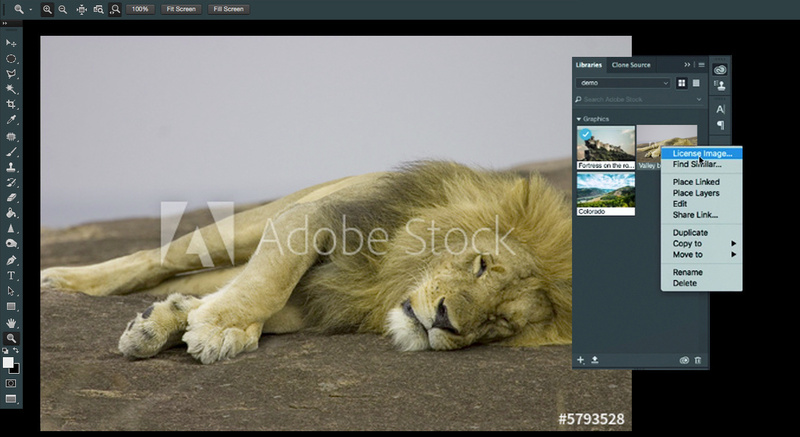 Adobe Stock has powerful search tools which make narrowing things down quickly a breeze. I especially like the "Find Similar" feature which does a great job of finding pictures in the same ballpark to what I'm after. With Zvereva's image being very softly lit with very little directional light to it I tried to find an image of a lion which had these similar qualities as well as being shot from roughly the same camera height too. Thankfully it didn't take long for me to find the perfect image by Adobe Stock contributor Tarei. 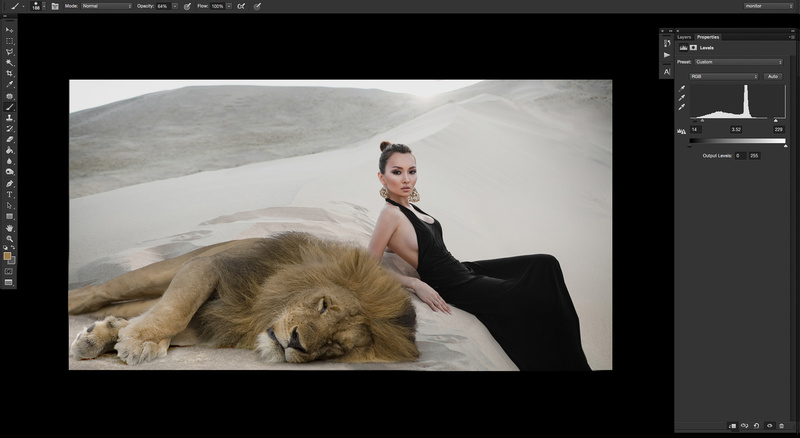 In this instance I want the lion to be lay down next to the model in the shot. 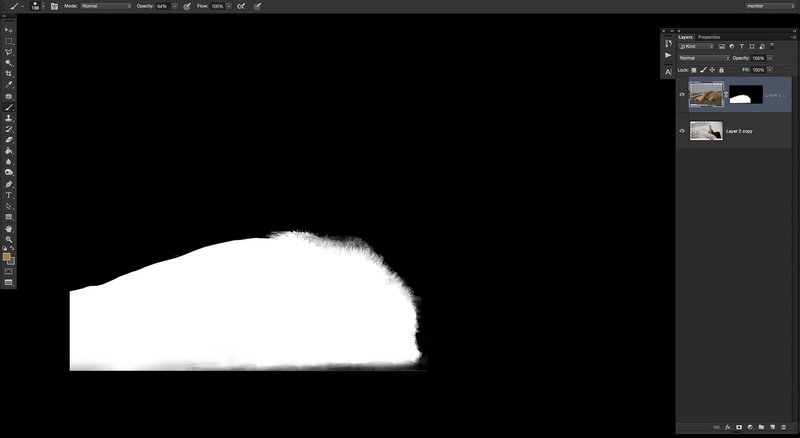 As there isn't much negative space in this image, I decide to increase the canvas size to make space for our lion. To do this I select the area to the left of the model with the marquee tool and use "Content-Aware Scale" to stretch this part of the image to create more space. 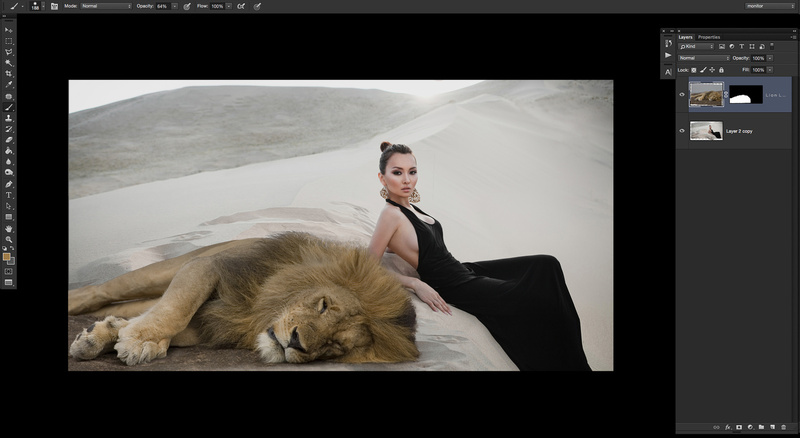 Once the canvas has been increased it's time to drop the picture of the lion into the same file as our model and desert scene. I briefly change the opacity of the lion layer so I can get an idea of scale and placement. After changing the scale of the lion slightly I'm happy with how the lion looks in the image. The next step is to create a quick image mask around the lion which I did with the brush tool and the refine edge feature. The composite is already starting to take shape, but the ground the lion is laying on resembles dirt rather than sand. 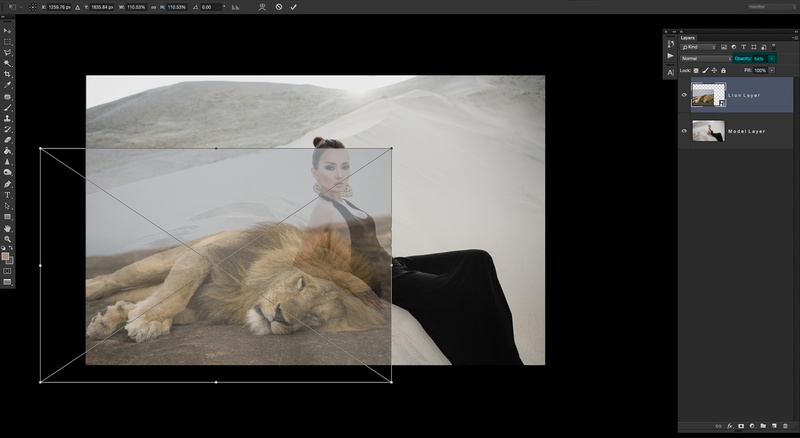 This can be quickly fixed by creating a levels adjustment layer on the lion image and playing with the shadow, mid tones, and highlight sliders until the ground looks more like sand. It's always much easier to make these adjustments when the image you are trying to match is also on screen. From there it's just a matter of dialing in the adjustments until everything blends together. What you will notice when you do this is not only does the ground get brighter, but the lion does too. I only want this new levels adjustment to affect the ground of the lion so I create another image mask so the body of lion remains untouched. Once all that is done I make a few adjustments to the colors and do a little dodging and burning to finish off the composite. Considering I spent very little time on this I'm rather pleased with the final outcome. 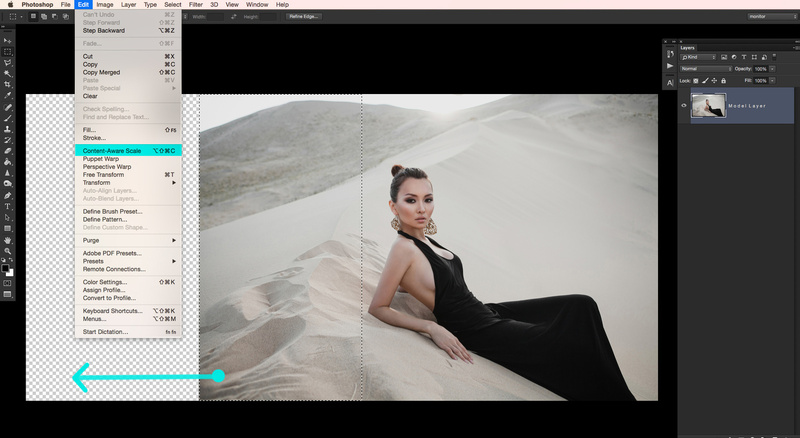 If you pay careful attention when selecting your stock images, you'll find that making composites isn't as hard or time-consuming as you may think. Compositing is becoming a go-to way to achieve the creative idea you have in your head. Personally, I would rather make great work with the help of a stock image than have to ever compromise on my creativity. If wild animals are not your thing, these same principles could easily be applied to compositing various landmarks, objects, or even things quite literally out of this world into your next masterpiece. The sooner you start thinking of using stock images as a powerful tool in the creative process the sooner you will quite literally be able to make the impossible possible. 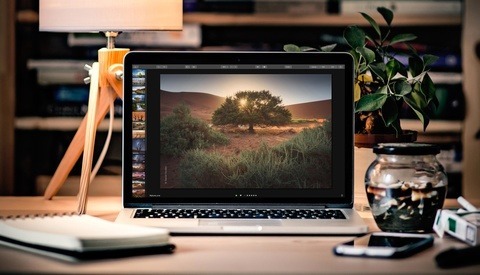 Get started with Adobe Stock today with 10 free images. Very convincing job David. This is something I've always wanted to try myself.